An interesting addition to your piano armoury, especially if you head straight for Cinematic. Editing flexibility. Convolution engine. Cinematic instrument version. Normal version not particularly inspiring. The Giant is, in essence, a sampled distillation of the unusual, and very large Klavins Model 370i 'Integrated Upright Concert Grand Piano'. It's 'integrated' due to the fact that the whole piano is built into the wall of the room in which it's situated. A high ceiling is required, though, as the design allows for pianos up to 5m in height, making it the biggest upright in the world! The soundboard alone is double the size of a typical concert grand. "Sampling of this mammoth beast was taken care of by Galaxy Instruments, well known for their other sampled piano offerings"
Sampling of this mammoth beast was taken care of by Galaxy Instruments, well known for their other sampled piano offerings. 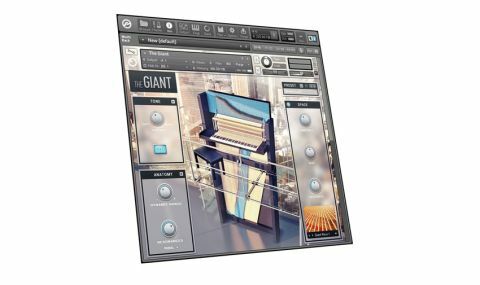 Weighing in at 3.9GB, The Giant comes as two quite distinct Kontakt instruments, each with their own sample set, GUI and associated controls. The Normal piano has three basic control sections: Tone, Anatomy and Space, providing a decent level of tweaking possibilities. Presets are included to give you a useful range of alternative timbres and are a good starting point for your own endeavours. The Cinematic version ups the ante by including a Sources section for selecting and mixing from a range of more experimental playing styles - including the wonderful Noises FX section featuring all manner of thumps and scrapes. The samples are then fed to a Convolution processor for tonal and temporal shaping - from subtle EQ, to reverse reverbs and tempo synchronised delay effects. In fact, this is based on the same 'effect convolution' technique used by the Galaxy X virtual instrument that earned an FM Platinum Award in June. This version does incur a higher CPU load, but that's something I'm happy to live with given the quality of the result. Both instrument versions have a basic, but fine-sounding IR-based ambience/reverb section. "The Giant is really two rather different beasts sown together"
The Giant is really two rather different beasts sown together. The more polite, Normal piano is rather too strident for this reviewer's tastes, unless Tone is pushed way down. Luckily, there's a lot of flexibility when it comes to customising the sound, with control over many areas of responsiveness, tonality and ambience. Despite this, in comparison to something like Cinesamples' Piano In Blue, it feels a lot less 'immediate' in playability terms. However, our preference was for the darker side of The Giant's Jekyll & Hyde personality. The Cinematic version is entirely different, and allows you to conjure up a wide range of unusual tones, from the conventionally playable to a weird and wonderful world of scrapes, buzzes and odd overtones. The convolution engine is the icing on the cake here - especially with some of the more unusual impulse responses it uses - massively expanding the range of possible piano-based tones. So, though it was more than competent, we weren't especially taken with the more polite side of The Giant, the other half is really very good. In fact, it's worth the price of admission for this alone.